Boutique, Five Star Eco Resort, Perfect for Couples. DEC Stay three nights but just pay for two! Details below. This secluded hotel offers amazing views of Nicoya’s beaches and a rustic style that help you relax and unwind. Enjoy well-appointed facilities, complimentary tours, and the Beach Club. Book three nights in a villa and get one of those nights for FREE. Valid for select travel dates between May 1st – December 14th. Save up to $295 during your stay. Located along the scenic beaches of the Nicoya Peninsula, Hotel Punta Islita is a secluded slice of paradise. Part of the boutique chain Small Luxury Hotels of the World, this upscale eco-hotel is a fabulous option for couples and families looking to completely unwind. 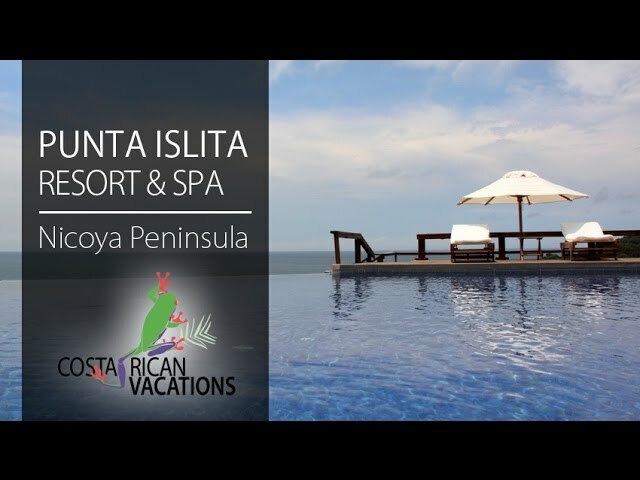 Hotel Punta Islita is comprised of 32 guest rooms and 20 private villas nestled along 80 acres of lush tropical hillside overlooking a private cove. All accommodations are very private with standard amenities like satellite TVs, A/C, safe, hair dryer, mini-fridge, and coffeemaker. Combining rustic local decor with understated tropical furnishings, the rooms are lovely. Each has its own private deck with hammock and an ocean view to soak in those breathtaking sunsets! Complimentary WiFi is available throughout the property. The hotel’s Pacifico Restaurant offers innovative twists on traditional Costa Rican dishes using fresh regional ingredients. The elegant yet casual setting under the thatched roof is extremely romantic in the evenings. The kitchen can accommodate special diets with advanced notice. A bar is located near the adult-only infinity pool, which guests can access until late at night. At a short complimentary driving distance from the hotel is the Coco’s Beach Club, right in front of the ocean. Here families may enjoy an assortment of seafood dishes, refreshing cocktails, and the kid-friendly pool. Take advantage of the playground as well! Stroll the natural coastline or take a dip in the ocean, take advantage of their spa, well-supplied fitness center, two tennis courts, and a nine-hole golf course. Set aside an afternoon to visit the Islita Art Museum during your stay. A la carte breakfast is included. The suites have an outdoor whirlpool on a private ocean-view deck and a bath tub that looks out over a small enclosed garden. The Pacifico Restaurant serves fresh seafood and local specialties. With a long list of complimentary tours and activities, you get a well-rounded, authentic experience at no extra cost. The Casa Spa truly makes you feel at home. There you can relax while being pampered by expert massage therapists and beauticians. The Borrancho Beach Club offers a family pool, gorgeous gardens, and healthy snacks. Punta Islita is Certified Sustainable by the Costa Rican Tourist Board, with a level 5 CST (highest available).